I've already been the happy owner of a Sony DSC-F828 "big" camera for over a year, and still consider it perfect for my serious photographic needs. However, precisely _because_ it is so big, it can be very inconvenient to bring along, and also very intimidating to potential picture subjects. Enter the new Sony DSC-T7. I didn't realize just how _much_ smaller, or more precisely, how much thinner it is than all other digital cameras until I saw it in person. It not only fits in a shirt pocket, it fits in a shirt pocket _along_with_ a Treo or an iPod. Because its 3x zoom lens is folded, it does not protrude at all when taking pictures, meaning most subjects won't even realize a camera is pointed at them, let alone that it is zoomed in and high resolution. This greatly easy getting natural expressions in informal photos. 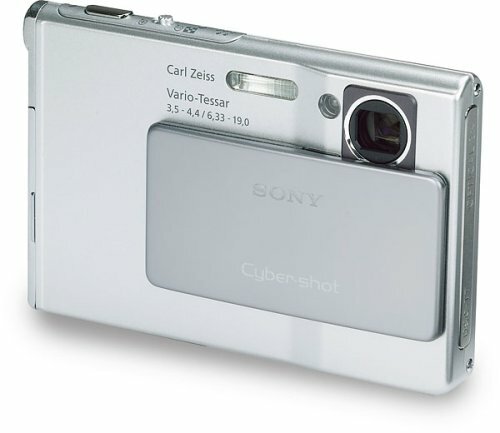 Next, the specifications of the T7 are better than those of othersimilar Sony cameras such as the T1 and T33 in ways I care about, such as doubling the number of pixels in the 2.5" LCD screen, including an auto-focus assist lamp, and USB 2.0 support without needing driver software when used with Windows XP. One of my pet peeves about digital cameras is that they are not protected from the elements. The T7 helps this in two ways. First, its on/off switch is a solid lens cover. Second, the camera fits easily in the smallest size zip-loc sandwich bag, and can easily be operated while in the bag, providing serious dust and splash protection. One further protection is needed, but easily handled. The LCD needs protection, which I provided by covering it with a sheet of screen protector plastic left over from an old PDA. As you might expect from such a thin device, battery life is somewhat limited (about an hour of continuous use, set up for maximum brightness, continuous focus adjustment, and automatic flash. For that reason, I bought a spare battery, and since the charger is bigger than the camera, suggest other buyers do the same. Similarly, plan on getting more memory immediately. The supplied 32M is good for only 14 pictures at top resolution. I settled for 512M, the largest I could actually buy at time of purchase, but would recommend the new 1GB size if available to you as you buy. The memory door appears a bit flimsy, so it seems best not to need to open it too often. I bought this for my point and shoot wife to take on a week-long trip, and thereafter to have it with us whenever a shot might present itself, but not surely enough to carry the large camera, or in situations where keeping the large camera clean and dry might be an issue. If you too are a serious hobbyist, do be aware of unavoidable limitations: 1) 5MP is good, but not as good as the 7MP of a few also (barely) pocketable cameras. I decided smaller size outweighed higher resolution, but you may feel differently. 2) F4 is 2 full stops dimmer than the F2 of my other camera, which matters quite a bit when the light is low, as does 3) the ASA maximum of 400, rather than 800. There's also 4) no place to attach a filter. For a second camera, these are all perfectly acceptable compromises, in my opinion. Highly recommended as a second camera for hobbyists, or as a first camera for folks who want a very convenient and very high quality point and shoot camera. The DSC-T7 camera from Sony takes the concept of portability to a whole new level. Remember the Motorola brick phones of the early 1990's? Well, that's how most of the other cameras currently on the market will leave you feeling once you've held the DSC-T7. This smallness however comes at a price; people used to larger cameras may take some time to get comfortable using this camera. I use a Canon EOS-20D for more serious photography, and switching to this camera for casual use almost makes me distracted due to its smallness. My wife however loves it. Pictures have the typical Sony look to them: crisp, sure and accurate. Coloring is almost dead-on correct; however Sony's in-camera post processing gives images a dynamic boost which, while looking very good, may look slightly unnatural to some pros. But then again, there are uses and there are cameras. For a travel camera and casual shooting, there is simply no match for the DSC-T7. On the other hand, no one will use it in a studio for professional photography, which is OK as well. I only wish that Sony were offering a carrying case as standard issue with this camera; it is a pity that they had decided to carry it as a separate item. It would be a shame to drop the DSC-T7 and have nicks and scratches on it. At least our box did not come with it, and here's hoping that Sony will at one point decide to include the soft case as a standard accessory with every camera. Recommended: 5 out of 5 stars. I bought this Sony camera at an Apple store a few weeks ago. It was expensive but I think it's worth it. -Lightweight: I bought this camera mainly for concert photography. It's light enough to carry around with you wherever you go. -Great features: I love how there are so many settings to choose from. You can play around to see what works well for your shots. -No hole for tripod: This probably isn't an issue for many people. You should know it's not compatible with a tripod though. Then again, this is such a small camera. Why would the average person want to use it with a tripod? It's supposed to be an on-the-go type of camera. -Battery: A full charge only lasts for approximately 85 minutes so it's a good idea to buy a spare battery if you're going to use this on long day trips. The spare battery is very expensive though. This is a nice unit to carry in the shirt pocket. I hate the lack of an optical view, the LCD is NOT convenient for point and shoot type photos. Especially out-doors. 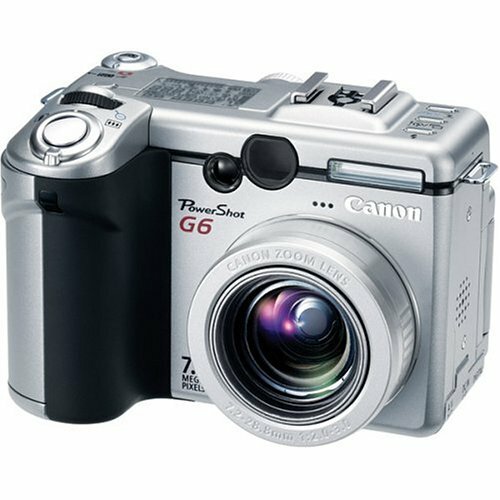 This is a special purpose camera and is very good for posed in-door or nature shots. Also, in the practical use of this unit, it is best to crank it down to the 3.2 pxl mode, or other lower res. The close shots at 5 pxl are phenomenal, every detail of a product label for example is perfectly reproduced. Good toy, but I like my DSC-P73 for every day use. I own the DSC-F828 (8 megapixel) Sony...and do a lot of varied work, usually taking it everywhere.But it's a bit slow out of the bag sometimes, for a simple snapshot.Therefore I purchased this camera (the T-3 Euro version) as an adjunct to the big brother. Frankly, 5 Megapixel appears a bit less sharp now that I'm used to 8 Megapixel ....and the lens CAN be a tiny bit soft focus in low light.Yes, there's relativly few manual adjustments, too. However, this little devil powers up FAST as I draw it from the Sony leather belt holster.Red Eye reduction, 3x zoom, *HUGE* view screen (really impressive for showing off to your friends what you just shot...), neat carry strap. I bought a travel charger & spare battery (these can charge while I shoot), extra memory (came with a 32mb - I bought a 128, then a 256.You buy a 512. ), and the nice Sony leather belt case.Look for a USB memory stick reader, like the wonderful SanDisk MobileMate MS (the size, literally, of a USB flash drive, i.e. keyring-able), and you're ready. You can afford this.Think about it.Super small, excellent quality, out of the way...but ALWAYS there.Get it.Or, let me put it another way, "Can you afford less?". PSWhat I REALLY like about this camera is that my big 828 scares the pants off my subjects because it's seen (to them) as "professional", yet no one runs away when I pull this little guy out.You can see the differences in their attitude right away. I get more intimate pictures, with minimal quality loss, using this camera far more frequently, now, than the 828. I bought this camera about a month ago and have been truly impressed.I know a bit about digital cameras having owned a few over the years and this camera presses all the right buttons for me.The camera is small, about the size and weight of a pack of playing cards, smaller even.The styling is great and the build quality is top notch.The camera has many features normally found on larger format cameras.The video quality is superb and nearly does away with the need for a camcorder for those holiday videos, works best out doors and in daylight.There is no set limit to video length except for the capacity of the memory card. A 1 Gig card holds about 13min of highest quality video, long enough for any take I can think of.The general picture quality is very good for a compact and the prints I've made to A4 paper are spot on.It is fast to start up and "reload".The LCD screen quality is the best I've seen on a compact.The macro/magnifying mode is a revelation, allowing for some "microscope" type close-ups.The interface is intuitive and user friendly.In conclusion this camera is perfect for the average user who needs a highly portable quality digital camera.Recommended upgrade would be a 512mb or 1Gig memory card for that high quality video. 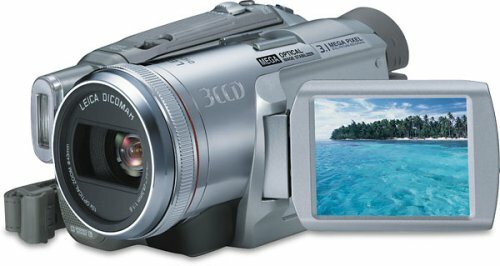 Perhaps the biggest failure of this product is the lack of documentation on how well this camcorder operates with Macintosh.Using a 4pin to 6pin Firewire cable (not included), this camera easily connects to Macs making an easy tranfer into iMovie for editing. In fact, I couldn't find any mention of how to use Firewire with this camcorder. This camcorder is extremely small and I was concerned about how well I would like the small controls. I was very surprised at how easy the controls were to use. Picture quality is very good, even in low light conditions. In-door shooting will usually require the whitebalance to be manually set because in auto mode lighting is yellow, but it is as easy as clicking a menu item. It also makes transfering from VHS to miniDV easy with the enclosed cables. I'm giving 4 stars due to the documentation. Excellent camcorder with a lot of feartures. Bravo to Panasonic hardware engineers. However, I spent entire weekend in trying to connect camcorder to Motion DV. Instructions in English are made from direct computer translation from Japanese, so it is very hard. French version a little better. No a clear expalnation between USB and IEEE connection options. As the result, you will do a false step in installation, then you will be not able to desinstall Motion DV, you will need to manipulate your registry files and so on. Finally I gave up and installed Premiere LE from my last camcorder whichwas working immediately with all features. First of all, let me say that I am NOT a camera bug or a photographic expert (neither digital nor film) so this is a new learning experience for me.I am very impressed with this product. It delivers professional results and is easy to use.Newbees like me can get great results with the AUTO mode, then when you have the time to do so, you can experiment with the manual settings for custom results.The nice thing about digital (with a computer) is that you're not throwing away expensive materials (ie film) in order to learn.You can just delete your failures and try again.When you get a pic that looks printworthy you can either print it using your PC or you can connect the USB cord (supplied) directly to a photoprinter (if said printer has a standard called PICTBRIDGE). There are many settings that you can control (ISO sensitivity, EV, White Balance and other settings that shutterbugs are familiar with) or you can set it to AUTO and let the camera set it up for you.It uses JPEG format and you can get much detail setting it to 4 megapixels but these pics turn out BIG (almost 2 megs).If you don't want your pics that big you can set them down to 3.2, 3,1, or VGA and they still look very good, but they are smaller and easier to store.The camera is about the size of a bar of soap and fits very easily into a pocket. You can also take "webcam" type movies. The documentation comes in print and on the CD and is excellent, going into much detail on how to use the manual settings for best results.My only disappointment is with the Photo Editing program that comes on the CD.This program dosen't offer much for editing your pics on a PC (no problem for me though.I have PhotoDeluxe). 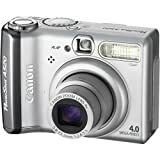 If you have a good editing program that came with your printer (or scanner) you might want to use it instead.I think the software included with this camera is more suited for HandyCams (video cameras). The camera has 32 megs of onboard memory which allows you to shoot 16 pics at 4 MPs, 20 at 3MPs, 50 at 1 MPs and 196 at VGA. It has a slot for a memory stick if you choose to buy one. If you do decide to buy one of these cameras, do yourself a favor and buy some rechargable NIMH batteries, because I'll tell you ( and anybody with digicam experience knows this) alkaline batteries do not cut it with this camera.It comes with 2 alkalines and I think I took all of about 12 pictures before they were WIPED OUT!I then tried some regular Everready alkalines I had just bought and they wouldn't even power it up.The NIMH's that I bought work excellent and last long in between recharges. So, all in all, would I recommend this camera?Absolutely!! 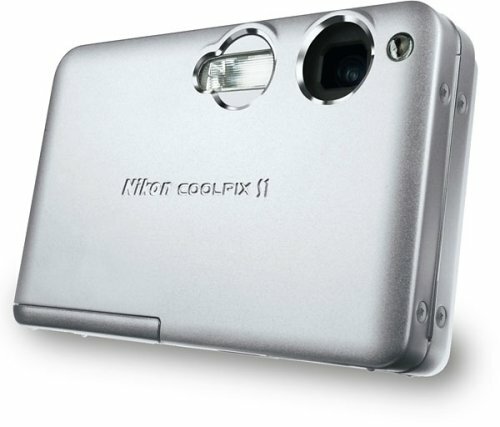 An excellent no hassle, worry free camera that fits in your pocket and delivers excellent pictures. The Zeiss lens makes this camera awesome. I have had my doubts about digital cameras but this little gem delivers crisp, clean sharp images that exceeds the quality of my Canon A1 SLR camera. Very easy to use and download. Well, just got this camera 2 days ago.Used it quite a bit for my daughters swimming lesson this morning. 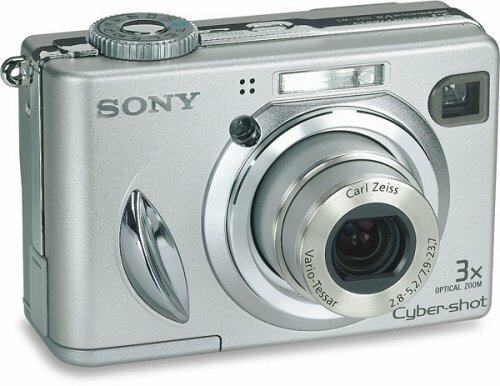 My old Sony DSC-S50 was just too big to be convienient and finally we upgraded to this newer model. Photos - excellent.I used a 2.1 MP for so long, a 4.1 really is a lot crisper.Cropping in photoshop leaves a much better image now. Video - excellent.Memory Stick Pro on FINE mode makes for excellent video with sound.Sure does chew through the space though.512 MB stick holds just 6 minutes of video. I dropped a single star because I was thinking this camera would be about the same size as the L1, but it really is quite a bit thicker.It still fits in your jeans pocket, just not as slim as I was planning. Olympus yet again raises the bar in the ultra-zoom digital camera arena with the 4-megapixel Camedia C-765. 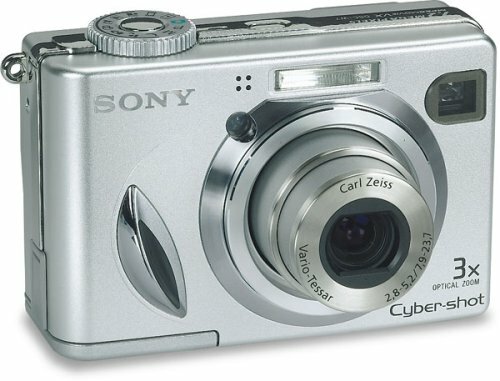 It's the smallest digital camera in the world featuring an optical 10x optical zoom (as of February 2004), measuring 4.11 x 2.36 x 2.7 inches (12-percent smaller than its predecessor, the C-750) and weighing only 9.9 ounces. 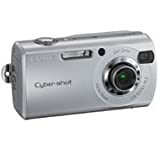 It also features a Super Zoom function that extends to 14x close-ups, movie mode with audio, fast USB 2.0 connectivity, and a bevy of manual features. &nbsp; Olympus' 10x optical zoom gets the detail of hard-to-reach subjects without loss of image quality. With its 4-megapixel resolution, the C-765 captures 2288 x 1712 pixel images for impressive, photo-quality 11 x 14-inch print enlargements. It als features a full range of resolution modes: 2048 x 1536, 1600 x 1200, 1280 x 960, 1024 x 768, and 640 x 480 pixels. It records both in JPEG and TIFF format. The C-765's bright (f2.8-f3.7) optical system--normally only found in pro-level SLR cameras--comprises 11 elements arranged in 7 groups and includes two aspherical lenses to reduce distortion as well as an ED element to help reduce chromatic aberration. The 10x optical zoom lens (6.3-63mm, or 38-380mm equivalent in 35mm photography) is combined with a 4x digital zoom for a seamless 40x total zoom. The new Super Zoom function--captured at 1600 x 1200 (2-megapixel) resolution--enables you to extend to an amazing 14x optical zoom. Use the C-765 to shoot video with sound using the QuickTime motion JPEG format. It records video at 15 frames per second (fps) and has two resolution modes: 320 x 240 and 160 x 120 pixels. The C-765 is one of the first Olympus models to feature TruePic Turbo, a new image processor that sharpens image clarity, contrast, and color for life-like results. This feature also makes the camera 30% faster in processing images and is combined with a super-fast shutter release time. The mode dial offers quick access to automatic settings, as well as four customizable "My Mode" settings. In auto mode, the C-765 offers point-and-shoot simplicity for flawless picture taking. For those times when you want to tweak your creativity, the C-765 has aperture priority, shutter priority, or full manual settings. The 6 Scene modes (controlled by the dial on top of the camera) provide fully automatic exposure adjustments in a wide variety of settings: Portrait, Self Portrait, Landscape-Portrait, Sports, Night Scene and Landscape photography. The 4 customizable "My Mode" settings help save time by allowing you to assign frequently used settings to the mode dial for quick access. The optimized electronic viewfinder (unlike many optical viewfinders) enables precise framing of the shot as well as displays all activated settings so you don't have to take your eyes off your subject. The C-765 is PictBridge compatible, which enables you to transfer pictures from your digital camera to a compatible printer (such as the Olympus P-10), without a PC or image-editing software. All PictBridge devices share three basic features: camera-to-printer connecting, single-image printing, and uniform error messages (in case something goes wrong). Images are stored on XD Picture Card memory cards. The card's small size, about the same as a postage stamp, helps to keep the camera size down. The included 16 MB card will store approximately 16 images at 2288 x 1712 pixels (at HQ, JPEG setting). Images can be downloaded to either a Mac or PC via ultra-fast USB 2.0 connectivity, which means the camera can be connected to any USB-based Windows 98 Rev2Me/2000/XP and Mac OS 8.6 or later computer without installing any software. The camera is powered by a proprietary rechargeable lithium-ion battery (model Li-10B, included), which provides approximately 175 shots per charge with typical use. It measures 4.11 x 2.36 x 2.7 inches (W x H x D) and weighs 9.9 ounces (excluding battery and storage media). I've had this camera for a couple of months and I love it. The pictures look great and it is very easy to use. Its big and boxy so it won't fit in a small purse or pocket, but its worth hanging a camera case around your shoulder if you like to take high quality outdoor pictures. 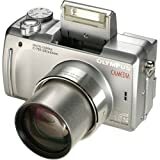 I replace my old Olympus 450 with this camera. I loved the old camera but it did not have all the features that I wanted. The new camera is great. It takes great pictures out of the box. If you spend the time to get to know all the features it takes even better pictures. I love being able to customize the settings. The zoom is the best feature of the camera. Allows you to get very close to your subject. Battery life is great but I would buy an extra battery because it does not give much warning when it is going. 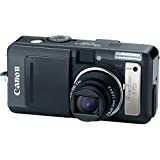 Other than a cheap point and shoot camera, this is the first real camera that I have owned. I decided to go with a digital camera that way I would practice my photography skills without wasting a whole lot of money on film. Overall, I have been very impressed with this camera. I recently got back from a trip to London and everyone was very impressed with the pictures that I got. For the beginner, you can set the camera on Auto Mode on and get great shots. For the more advanced photographer, the camera offers enough creative control over things such as aperature and shutter speed. I experimented with the camera in the Sport Mode and was able to freeze an acrobat in the middle of a flip. This camera is not for a professional, but for the beginner to an intermediately advanced photographer, it makes a great camera. My only real complaint with the camera is shooting pictures at night or extremely low light situations is somewhat difficult. I recommend using a tripod or some other way to stabilize it for best results. It is possible that there is something that I haven't figured out yet since I feel like I am still learning a lot about this camera. Other than this though, I highly recommend this camera to anyone looking for a solid, reliable camera that takes excellent photos. I just got this camera. I love it. It takes excellent pictures and is easy to use. A great upgrade for digital camera users. First and foremost, it has the 10x optical zoom. I often found with the C-3030 that I couldn't get close enough in on people and animals if they were more than about 20 feet away. This one solves that problem. Second, the lag time from pressing the button to the shutter releasing is significantly reduced in this camera. I can actually capture my son before he has left the picture frame. It still isn't as fast as an SLR, but it is light years ahead of where it used to be. Third, I have noticed significantly fewer red eye issues with this camera. This is a big deal for me since everyone in my family is fair skinned with blue eyes. Last, the battery is a Li rechargeable. It only takes about two hours to get a full charge. Picture quality is exceptional. I haven't had any problems with the zoom lens (but I do try to steady the camera on a fence or something if the zoom is fully extended). All in all, I think this is a great camera. Admittedly, I don't use all the bell and whistles -- mostly the automatic settings. Oh, and one other thing I like -- it is easier to control the flash with this one since you have to open it to use it. 2. With two NiMH rechargeables (2300 mAh) you can take up to 350 at 4 Mpix quality!!! 3. With my 512 MB SanDisk Ultra II SD card camera is ultrafast! I researched for weeks before picking up the Canon PowerShot A520, and I must say I'm really having fun with it.It's my first digital camera - I've used regular film for years.I was able to take pictures with it straight out of the box, 2 minutes after buying the camera. I like how it has a lot of manual controls but you don't need to use them unless you want to because "Auto" does a pretty good job with photos.The 4x optical zoom is great - more than the standard 3x offered on most cameras. I've seen complaints about redeye and difficulty in low-light focusing on other review sites, but I have yet to encounter any such problems.My indoor flash shots at a restaurant had WAY less redeye than my old film camera, and I found they came out clear and sharp.Night shots without the flash are also easy to take, because you can slow the shutter speed right down.All the scene modes seem to do what they're supposed to. A few minor gripes: the LCD is difficult to see in bright sunlight.The camera literally eats AA batteries, so I recommend picking up some rechargeable NiMH batteries instead.And the movie mode - while cool - isn't all that wonderful because you can only take 30 second clips and they look grainy.But hey, it's a film camera, not a digital one. I'm still learning the camera but so far, so good. Let me begin by saying that Canon makes exceptional digital cameras; the best in the market right now. This is because they have always used high quality components since they began manufacturing digital cameras. This one is no exception. The Axxx series is the successor to the excellent Axx series, with a few very useful upgrades, such as the switch from 4AA to 2AA batteries (with no decrease in camera life! ), and the 4x optical zoom. First off, the A510 and A520 are identical except for the 3.2 megapixel sensor in the A510 and 4mp on the A520. Today, megapixel ratings are similar to Ghz ratings in the computer world: They used to mean a lot, but with today's cameras, it doesn't mean that much anymore. More megapixels do NOT mean a better image. They mean a larger printable image. In this case, the A510 has a maximum resolution of 2048x1536 pixels, or an 8.5x11 picture. The A520 has a max resolution of 2272x1704 pixels, or a picture slightly larger than 8.5x11. Unless you need a slightly bigger picture, the A510 is a better buy. When it comes to the Axxx or an SDxxx, it depends on what you need. The Axxx series will give you a better picture quality, manual controls, and standard AA batteries which actually last twice as long as the SDxxx series' proprietary batteries. The SDxxx series will give you better movies, the new Dig!c 2 processor, and a compact, cool looking camera, at a higher cost and with a very fragile exposed LCD screen. -The lcd is protected by a plastic layer, unlike the exposed and easily broken SDxxx lcds. If you do choose this product, the first thing you should buy is a larger SD memory card. The camera comes with a 16mb MMC card, which is pretty much useless. MMC cards are slower than SD, and 16mb will fill up very quickly. You should also consider a case, such as the very affordable and custom fit PC-65. Also, as with any camera, rechargeable NIMH batteries are a must. You don't need to pay for the expensive Canon set however, similar offerings from Energizer, Rayovac, etc. will work fine. Best selling digital camera series! 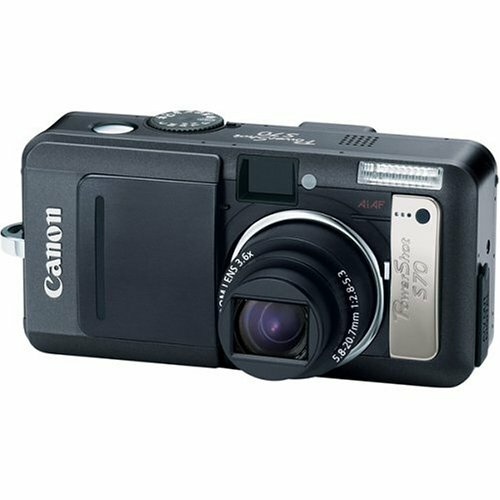 Canon has fully redesigned the Powershot A series to make it lighter (uses only 2 AA batteries now), smaller and with 4x optical zoom. 1. Very good image quality. 2. 4 MP and 4x optical zoom (A510, the 3.2MP version should be fine for most though). 3. Priced right, unlike some overpriced digicams out there. 4. Works on 2 normal AA batteries (buy rechargeable ones for extra life and lower cost), unlike expensive & hard-to-find propreitary batteries. 5. The menu on the Canon cameras is light years ahead of most other manufacturer's. Lots of manual options and scene modes. 6. Battery and SD card doors seem to be of above average quality. 7. 1.8" LCD screen is bright and fluid. 8. Uses standard SD cards, unlike propretary memory cards like Memory Stick or xD card. 9. Can attach extra lenses if one buys the adaptor for it. 10. Actual LCD screen looks nicely protected below a plastic plate. 1. The camera is still quite thick (although not bulky). 2. It uses Digic instead of Digic2 processor in other new Canons. 3. Tripod mount is on the corner and made from plastic. 4. Doesn't have that cool-ness like iPod or Elph series. 5. Nothing else different except extra MP from A510. Save your money and get the other one. If you're a "digital dummy" or "photograpy phool" like me, then this is THE camera for you - and even if you're not!! This camera's easy-to-decipher directions had me taking excellent photos the very first night. The software was very user-friendl, easy to install, and quick to load even on my sloooow computer system. The zoom capabilities are terrific and the superior focus makes it impossible to take a bad picture. Its small size was a bit intimidating - I worried about dropping it - but it fits right in your hand, no fumbling! Forget about clunky 35mm cameras and their heavy cases - the Nikon fits right on your belt, as light as a cellular phone. The viewscreen helps you see what your photo will look like, and lets you instantly play back what you've just taken so you can keep or delete. A friend who owns a more expensive model says this is as high-quality as her model. Highly recommend this camera! GREAT for anyone of any age, and the low price- not much more than what my Canon 35 mm cost -puts the wonders of digital within everyone's price range. 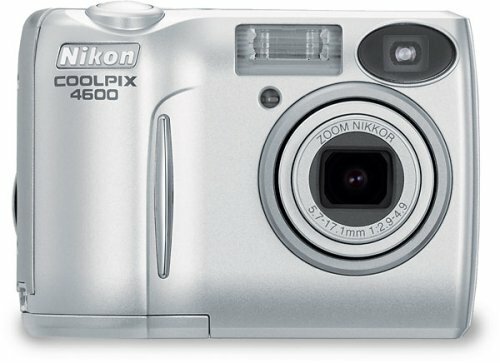 I looked at the Nikon Coolpix 4600 in a store and it sure looked exactly like my Nikon Cooplix 4100. I have been looking over the specs and they also look the same, except that I see the 4600 is 10 grams lighter, with the body a few millimeters smaller. I do not see this as an advantage, since presumably the case was designed for a degree of sturdiness, and this may be sacrificed. Whether there is any difference in performance, I do not know. I suggest you compare the two models and then look at the reviews for the Nikon 4100 before you buy. Some people like the 4100, some do not. Whether Nikon corrected any of the deficiencies in the 4100, I do not know. The firmware may have been changed. Some of the negative comments about the 4100 are unfair. For example, in the continuous mode it will shoot fairly fast, a little faster than one frame a second. Like any digital camera, you have to know all the bells and whistles to get the most out of it. The big problem is the slow "film" speed. It is rated at 50 ISO, but my tests with a light meter say it is actually 25 ISO. This is fine if, like a professional photographer, you plan to use a tripod for all your shots, for that is what professional photographers would do if they were using film this slow. It leaves me wondering how accurate the speed ratings of other Nikons are. Given that the Nikon 4600 specs here do not list the ISO film speed, I would assume the worst. I find the 4100 is OK for snapshots with a tiny camera you can carry around in your pocket. But for higher quality shots, I have since bought a much better, slightly larger camera for about the same price as the 4100. And so the Nikon is usually gathering dust. The bottom line: I suspect Nikon may have wanted repackage the 4100 because the reviews weren't so good. Cons: Slow recharge after flash, Slow image processing, LCD turns off after each shot. viewfinder for centering your object. 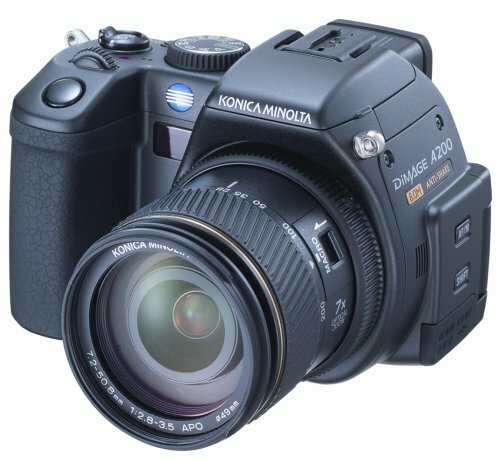 A close cousin of the Dimage A2, Konica Minolta's SLR-style Dimage A200 offers a smaller, more rounded body design and is lighter by 2.1 ounces. But it's packed full of powerful features that will be appreciated by a wide range of photographers, from professional to advanced amateur. 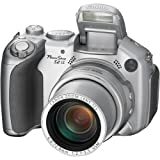 In addition to its 8-megapixel resolution and 7x optical zoom, the Dimage A200 features a movie mode with 800 x 600-pixel resolution, 1.8-inch flip-out LCD monitor, and Minolta's anti-shake technology to keep things smooth. The Dimage A200 has an 8.0-megapixel, 2/3-inch interlace scan CCD that can subtle, expressive images--even individual hairs or the stitches of a suit in sharp detail. It has the following resolution options: 3264 x 2448, 3264 x 2176 (3:2 aspect ratio), 2560 x 1920, 2080 x 1560, 1600 x 1200, and 640 x 480. The 7x optical zoom GT lens is designed specifically for digital photography with sharper, clearer images minus any color aberration, even when using the large aperture setting. It has a 28-200mm equivalency in 35mm photography and a focal range of f2.8 to f3.5. It also has two digital zoom options: a normal 2x and an interpolated 4x. With its proprietary new advanced LSI engine and CxProcess III image-processing technology, the DiMAGE A200 provides high-speed and stress-free image processing with low power consumption. And, its ability to suppress noise and provide exceptionally accurate color reproduction means that users get high-quality images every time. The Dimage A200 features a CCD-shift mechanism, outlined above in green, to stabilize images by offsetting the shaking pattern of the user's hand. 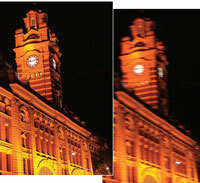 Below, a photo with Anti-Shake off (right) and the same subject with Anti-Shake on (left). The Dimage A200 offers a true VGA (640 x 480 pixels) movie mode, enabling you to record video at TV-quality 30 frames per second (fps). You also have the option to shoot at a larger resolution (800 x 600, SVGA) at 15 fps, good for viewing on a PC screen. Unlike many digital cameras, the Dimage A200 allows use of both the optical and digital zoom while recording movies, and the Night Movie function makes subjects highly visible even in dark settings. You can shoot a maximum of 15 minutes of video with audio. The Anti-Shake feature provides a highly effective way to deal with camera shake--a major cause of substandard images, especially with telephoto shots and when shooting in dim lighting. The Dimage A200 features a CCD-shift mechanism to stabilize images by offsetting the shaking pattern of the user's hand, providing stability at up to three shutter speeds slower than on digital cameras without an Anti-Shake function. Images are stored on CompactFlash cards (Type I/II), and it supports Microdrives. The Dimage A2 does not come with a memory card. It connects to Macs and Windows-based PCs via USB 2.0 connectivity. By directly connecting the Dimage A200 to a PictBridge-compliant printer, you can easily create prints without going through a computer--just choose your image directly from the LCD monitor. The camera's 1.8-inch TFT Vari-angle LCD monitor rotates 270 degrees vertically and 180 degrees horizontally, allowing you to get a clear viewpoint for shooting artistic angles or taking flawless self-portraits. In addition to JPEG images, the Dimage A200 can also save captured images to RAW (12 bits per pixel), RAW+JPEG, and TIFF formats. The Ultra High Speed mode captures images at a continuous advance of 40 frames at 10 frames per second. Automatic or manual popup flash has a five-second refresh and fill, red-eye reduction, slow sync, and rear flash sync modes. Sure-grip, ergonomic body makes it easy to carry and use anywhere. The Dimage A200 is powered by a proprietary rechargeable Lithium-ion battery (NP-800), which provides power for approximately 260 images or 330 minutes of continuous playing time. It measures 4.49 x 3.15 x 4.53 inches (W x H x D) and weighs 17.8 ounces without battery or media. This has been the best digital camera i have ever bought! the quality of the picture that it takes enables me to pictures that i am unable to take with a high quality slr. the video quality is not that great but if you are serious about still pictures this is a great investment for someone starting out their digital experiance! I'm enjoying my new W5. I've had lots of fun taking pictures in every kind of circumstance I can think of. The camera has the capability of a very long exposure, which I've enjoyed immensely, and the night shots I've taken are super. I enjoy remodeling. The W5 has a 30mm screw mount, and I purchased the wide-angle lens at my local Sony Style store. I am very happy that I have the capability to add lenses and/or filters. The person who complains that the "waving hand" shows when the light is low -- yes, it is just a warning -- so you the user knows what's going on. You know if the camer is not stable you could get some fuzziness. I think it's better to know that something requires a little caution, than to get crummy pictures because I didn't know. It has a large screen, it has a screw mount for lenses/filters, it has a metal screw base for tripod use, it uses regular AA batteries, it uses my old Sony memory (plus the new Sony Pro memory I bought), it takes 640 x 480, 30 frame per second video, with sound, and it's among the lightest in this class. Honestly, I think it's hard to beat. is the short review. My sister had an Olympus 3.1 MP and her pictures blew mine way. I had serious clarity and focus problems. My prints were terrible for the most part and I am considering returning this camera. Sorry Sony I was burned this time. clarification of the "little waving hand"
Just a clarification of the negative reviews below - the "little waving hand" does not mean that the camera is moving.Instead, it means that you are trying to take a photo with a setting that would require a very steady hand to get a sharp result.That is why the hand doesn't go away when you put the camera on a table - and you can still take good pictures under these conditions, if the camera is held steady enough.This is a great little camera that I have been totally satisfied with so far.And, just as an aside, this information is in the user's manual, it might be a good idea to read this over before writing bad reviews on this site. I take basic point and shoot pictures of my family and so on.I was really disappointed with the image and focus quality on this camera.If *anything* is moving, it tends to show up as a blur -- even a child waving his hand. The "camera unsteady" warning came on every time too.I even sat it on a table top, and it still warned "camera unsteady!" What glitters is not always gold. I had this camera for 14 days. 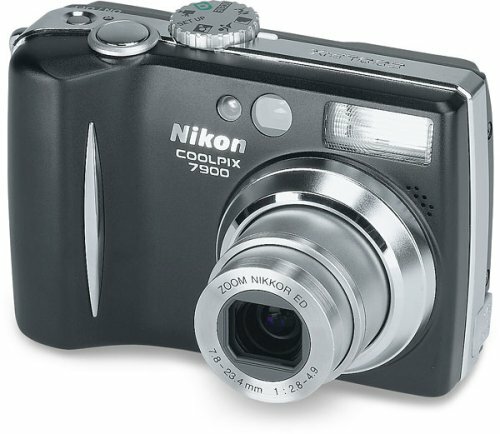 I went to the store to buy the Canon SD500, and the design of the Nikon Coolpix 7900 grabbed my attention. The sales person informed me that the only difference between the Nikon and the Canon was the name. In a series of 100 photos, the Nikon took around 6 crystal clear shots. The remaining 94 shots were blurry and lacked quality.I upgraded my Olympus C3040 (3MP) with the Coolpix 7900. My Olympus outperformed the Coolpix in all respects, except for battery type, weight, and size of camera. When I returned the camera to the place of purchase they asked if I was sure I was "doing it right. "I am an artist and published photographer. I've been taking pictures with digital camera for 5 years. I carefully read the instructions, I even called Nikon to ask for assistance. This camera cannot take QUALITY photographs consistently. Especially in low light. Bottom-line--I found it to be a horrible camera. A typical case of what glitters is not always gold. I returned the camera for the Canon Powershot SD500 and my first three photos were pristine. My wife's Nikon SQ died so I wanted to get a *small* travel camera as a replacement. The 7900 is indeed small. It takes great photos outside and will take good full frame 30 fps movies until the SD card is full (bar graph on screen). I've taken blury low-light candid photos w/o flash, but most are due to camera movement rather than focus problems (when looked at in Photoshop). The camera is a little /too/ small for me to grip steadily and hold against a door frame for candids. It'll be a great travel camera for her. Large LCD, good battery life, 7MP images, Image Stabilization. Disappointed that it's built in China like most everything else and Noise Reduction mode is a little too painterly for me -- I'll clean up my images myself. 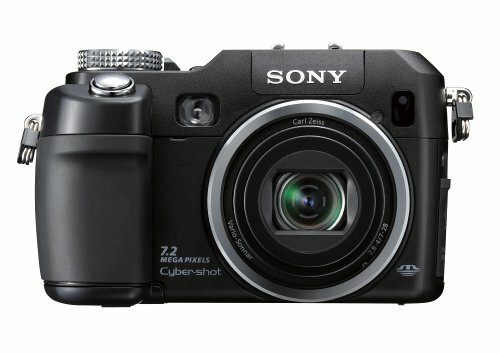 The 7900 sure is an attractive little camera with it's sleek body and high mega pixel count. Like several other Coolpix cameras, including the Nikon 8800, this camera can't focus well in low light. I don't know why Nikon continues to release these cameras with the same flaws. The AF system on the Coolpix line is contrast based and in less than ideal lighting it can lock focus, but get wrong repeatedly. You can visit DPreview.com and Nikonians.com for more info on AF weaknesses with the Coolpix line. This is a serious warning for buyers! Website forums for Nikon are filled with rabid supporters of the products, even when they haven't tried them. Another funny move is when the focus problems are mentioned by someone they quickly post a shot taken on the dark side of the moon! What exactly does this prove? The 7900 CAN take a low light shot, but it will often miss the shot as well. Don't trust samples taken in low light since you have no idea how many missed shots it took to get it. Buyer's remorse makes camera owners say and do anything to defend their purchases. Point blank: The 7900 has poor auto focusing compared to MANY other cameras. To make matters worse it has a VERY weak AF assist light just like the 8800. Insult to injury. A Pentax Optio S5i focuses better in low light without the lamp and costs far less. A Canon A95 also has superior focus ability, though not the best of it's class. High count sensors mean little when you miss a shot due to focus, right? When the 7900 DID get the focus right, images seemed slightly soft overall. While it has many modes there's no real manual control of the camera. This is not good for the growing photographer or the shooter who likes to fine tune. - everywhere without flash, with flash, outiside in office, etc..
the shutter speed can be little slow. when it's bright enough, it's faster and I think nobody will have any problem. 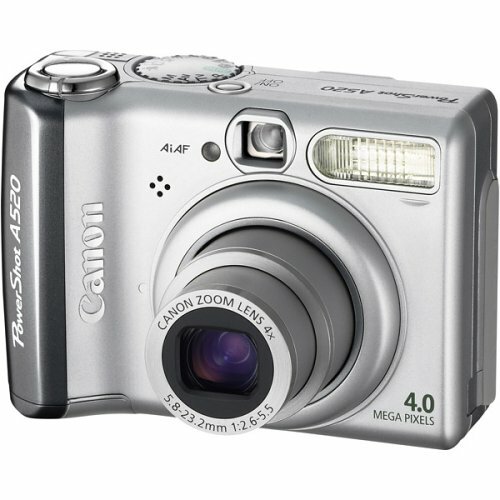 Especially I had so hard time choosing this camera over Canon SD400. I chose this one because when canon take pictures of people, it tend to make their face bit red. so I don't really care or know about what soft edge is or anything like that. If pictures look clear and pretty, I'm just fine with them. somebody here showed review pictures of S1 from dcresource. they were horrible pictures! I was so worried because I already ordered it. However, I don't understand now how that person came with those pictures. and I'm glad I got this one! I recommend SD400. I have seen lots of pictures of SD400, it takes great pictures, too!!!! Nikon is the last of the Japanese digital camera makers to come out with a ultra-slim (<= 0.8 inches thin) digital camera, and Nikon has apparently taken many a page from its competitors' playbooks and come out with a deliciously good camera. Before I continue with my review, let me point out that there's a jet black version available (unfortunately not on Amazon yet) which simply looks much better than this silver version.If possible, I recommend you get the black S1.You'll surely impress everyone on your block. Despite being a small and light -- and pocketable -- camera, the S1 takes surprisingly good pictures.Of course, it's unreasonable to expect the kind of quality you can get on a Nikon D70 SLR or Coolpix 8800 "bridge" camera, because these latter models are bigger and therefore have a larger lens (very important for great optical quality) and a larger sensor (important for better color accuracy and lower noise), but I can say that the S1 has the best picture quality in its class, even bettering the great models from Canon (SD400, SD500, etc. )In normal lighting, S1's pictures are sharp and very accurate in color.This latter is very important for getting eye-pleasing photos.Even indoors, the S1 does a decent job; since the lack of light always makes photography difficult, the S1 is better than most.BTW, when indoors, using a camera's built-in flash always results in harsh-looking pictures where the background is dark and ugly.Instead, try mounting the camera on a tripod -- the S1 has a tripod mount -- and taking a picture without the flash.The picture you get will be much more pleasing to the eye. In short, the S1 is a trustworthy performer when it comes to picture quality -- once again, with the necessary caveat that you don't compare this with a D70 d-SLR.I've seen thousands and thousands of digital images, on screen and on paper, and I'm pretty impressed with the S1's image quality.I simply don't think you'll find another ultra-slim camera that can take better pictures than this. Nikon has put in a lot of effort -- and marketing -- in creating in-camera software editing, such as in-camera red-eye reduction and the new D-lighting (which lightens up dark shadows and darkens blown highlights).Both of these are done during playback. What amazes me is Nikon's exclusive "face-priority" autofocus (AF) mode when shooting: it can automatically identify the faces in a picture and focus and expose on the closest or centerist face.This is truly AMAZING and works very well -- provided the lighting is not too shabby, or the facial skin tone not too dark.This works especially well in restaurants.You know the drill: you gather your friends at the dining table for a picture, and lo and behold, all too often the camera focuses on the white table cloth in the background or that giant Coors neon sign in the back instead of your faces.Nikon S1's face-priority comes to rescue.The only caveat is indoors, it doesn't seem to work as well as outdoors when lighting is aplenty. 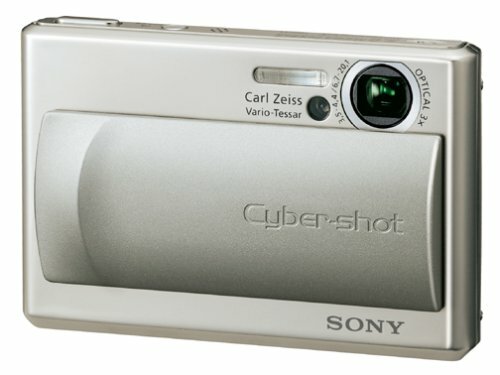 The S1 does not have an optical viewfinder, so for framing you rely on the 2.5" LCD screen.The screen is bright and covers 97% of the shooting frame, but its 110,000 pixel resolution is only average.This pales in comparison the 230,000 pixel count on the Sony Cyber-shot DSC-T7's 2.5" LCD.The Sony's LCD is also brighter, but the Nikon S1's is not shabby at all and compares favorably to the LCD on most ultra-compact cameras. One area in which the S1 does lag market share leaders such as Canon and Casio and, to a lesser extent, Sony, is the shutter lag speed.The latest models from Canon and Casio are super-fast and have negligible shutter lag, meaning when you press the shutter button, the camera takes the picture in milliseconds.The S1 has a noticeable shutter lag: the camera takes a fraction of a second focusing and taking the exposure before the shutter releases.This can be a problem when you demand instantaneous response from the camera, such as when you want to capture those Kodak moments of an energetic baby or child.Many people place a lot of emphasis on shutter lag, so this may be a serious problem for them. There are, however, two solutions.First, you could press the shutter button half-way and hold it there to pre-focus and pre-expose, and when the moment you want arrives, just press the button further down to release the shutter.I'm not saying this to excuse Nikon for not including better shutter lag performance (esp. given the S1's price point), but in general, it's always a good idea to pre-focus, even with a fast digital SLR such as the Canon Digital Rebel XT or Nikon D70.One benefit from pre-focusing is you minimize the handshake when pressing the shutter button, since your finger travels less than from the "up" position.Second solution is use the S1's nice continuous-focus feature which allows you to focus on a moving subject without pressing the shutter button.This continuous-focus (also known as servo AF) feature always keeps the subject in focus, at the expense of battery life and slightly more wear on the focusing motor in the lens. Conclusion regarding shutter lag: if you absolutely demand as little shutter lag as you can get on an ultracompact camera, consider the Canon SD400 or the Casio EX-Z55/Z57.The Fuji Z1 is reportedly very fast, too, although I haven't played with it yet.If you don't mind shutter lag or are willing to use one or both of the solutions outlined above, then you'll love S1 for its other great features (excellent image quality, big LCD, easy interface, ultra-cool styling).My advice: if you don't know much about shutter lag and its implications, check out the S1 and other cameras in a store and pay attention to the time between pressing the shutter button and hearing the "click" sound characteristic of shutter release.My OWN personal preference is I always pre-focus (solution #1) when I need to minimize shutter lag, whether I'm using the S1 or my beloved D70 d-SLR. 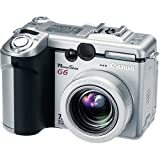 What else can I say?You get 3x optical zoom (equivalent to 35mm-105mm focal range in 35mm format), a LiIon battery that's about average in performance (the king in this department is the Casio Exilim EX-Z55/Z57 series), and a cradle which you need in order to transfer pictures. (I myself use a USB card reader that takes the SD card. )Speaking of this, the Nikon S1 kit does not come with an SD card, but the camera itself has 12MB of internal memory, which isn't a lot at all. Supposedly the "S" in S1 stands for style, and Nikon has definitely created a very stylish and very desirable ultra-slim digital camera -- especially in the black-body version.But great looks are not the only thing the new S1 has; its picture quality is simply the best in its increasingly crowded class.Finally, you can impress your friends and speed-dating dates with a camera that not only looks good and goes into your pocket, but flatters your subjects as well. Finally, some quick advice: 1) be sure to hold the camera very steady when pressing the shutter; fuzzy pictures from handshaking is the #1 complaint with these tiny cameras; 2) don't let your left hand block the lens; 3) protect the huge LCD screen well; 4) there's a new model called "S2" that's coming out which you might want to investigate before deciding (I think the S1 looks much better). I have a Canon Powershot G2 and my wife\'s cousin bought this camera (Nikon Coolpix S1). We both took pictures at lots of different light settings and here is my conclusion about this camera. 1. Very small and thin. Easily put in pocket. 2. High megapixel resolution and pictures are good in proper lighting. 1. Very small and thin. It is good for small people but for someone big, the camera is too delicate and buttons very small. 2. The screen is unprotected and can be damaged easily in the pocket. 3. Low light photos are not illuminated well enough by the flash so you might just have the subject lighted up and the background dark. 4. Don\'t know if it is due to small size but if you casually take out the camera for a picture, the chances of picture being blurred are high. 5. Also, almost 80% pictures had red-eye problem which can be removed easily but still is cumbersome. Camera is an entry level camera good for small people. The main asset is the small size. 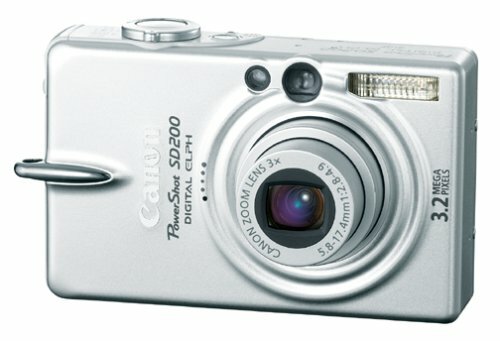 I've been looking for a replacement for my Canon S230 3mp camera off and on for a couple of months now. When I saw this camera; its size and 5mp quality I made the leap. First impressions of this camera are very positive. The learning curve is basically flat. The menu's are very intuitive and easy to use. The 17 or so different shooting modes are very easy to understand and to actually use. The unit itself slips into your pants pocket and feels like its not even there. In fact this is the first camera I will carry with me everyday because of its sleek and light weight design. As far as photo quality is concerned, I'd agree with one of the other reviewers - its good, not great. I'd have to say its a half step up from my Canon. Having said that I have to remember this is not a Nikon D70, its a handy and very capable everyday shooter with lots of cool features. The one minus that I've noted now that I've been shooting everything under the sun with it is this; I have big hands and this unit is so petite that I've found my left ring finger showing up in the pictures. I have to be constantly aware of where my digits are when shooting as, with the lens so close to the left edge of the camera they easily get included in the shot. The other thing I don't particularly care for is the docking station. It appears to be mandatory for recharging the battery which is a bit clunky especially if you want to travel with this unit. The docking station is required in order to recharge, you've just doubled the size of the camera in terms of packing and carrying along on trips. I would much prefer to have a recharge cradle like the Canon uses or just a single cord that I could plug into the camera but there doesn't seem to be an option for one. Finally, the PhotoProject software that comes with the unit is really a joke. Don't even think about using it. I download my shots via Windows Explorer as the unit shows up as just another USB storage device. The software is bloated, slow, (and I have a very fast computer), and basically useless. The camera does come with a nice little application that allows you to stitch together multiple pictures to create panaromic photos. When used in conjunction with the Panoramic shooting mode on the camera the results are really great. I have for years taken shots and then tried to stitch them in Photoshop or PhotoElements with the results being disappointing but this little application gets it right and its a snap to use. I also purchased a 1gig SecureCard for the unit. At present it hasn't arrived but I'm using a 256meg card I previously had it it works great but I want to have the most storage I possibly have as the shots tend to average 1.5m shot. 256Megs gets you 99 shots at 5mp. I'm very happy overall with this little camera. Its easy to take with you everywhere you go, the pictures are very clean and of high quality. Again, remember its mission - to deliver a compact, capable and affordable camera that is pure point and shoot. It delivers. Oh, and I can't stop before I mention the beautiful 2.5 inch rear display - very cool and viewable even direct sun. I bought this camera primarily for it's compact size so I could carry it in my pocket anywhere I go. Nikon has always produced a quality product, and this camera feels solid and looks good. The screen size is a major plus. As far as the images go, they are only OK. For a 5 megapixel camera, there is more "noise" or grain than I would expect. The redeye feature works fairly well, though I actually had one image's red MOUTH touched up by the camera's internal software. When the picture was printed, the lips of my subject were recolored as if they were redeye! I guess the camera was fooled in that case, and it only happened once. very easy to use point and shoot. fast picture taking ability and does a good job auto-focusing. with 256 mb card, can hold 140 pics at default settings (5mp, fine). lcd screen is awesome and makes this camera a joy to use and review shots to ensure you got what you wanted. couple minor annoyances...battery will fall out when you open compartment, no locking feature on front lense cover (sometimes it will open on its own in your purse/pocket), no included carrying case....to protect lcd screen while in pockets or purse from scratches. quality of pictures is on par or better than my olympus c4000 at 1/4 th the size. docking station is fast with usb 2.0 instead of 1.1 like most others. recharges battery in under 3 hours. this camera has impressed me....size, quality, and easy to use. i recommend for those that want to carry a camera with them at all times without extra luggage. I purchased this camera about 2-3 months ago for general purpose/travel photography with my family. I was leaning towards the Canon S500, but went with the Sony T1 due to it's minimal size. Since purchasing, we have taken numerous photos, using both the "auto" mode as well as the "program" mode with some of the suggestions from previous posters in this forum (adjusting ISO, EV, sharpness, etc.). Overall, about 50% of the images are good to very good, and the remainder are very poor. The problem seems to primarily be with the focusing sensor, as a lot of images are not in focus - now I know what you're thinking, maybe I just didn't have the subject in the center of the focusing brackets, or the subject moved after holding down the shutter, or whatever, but trust me - that is not the case. I take numerous digital photos for work with Nikon, Olympus, and Kodak cameras, and only 5-10% of these are not in focus. In several of the pictures NOTHING is in focus, which doesn't make a lot of sense unless the AF sensor is just not picking anything to focus on!? Also, several of the photos have been blurred, even in bright sunlight, as though the shutter speed was too slow. (Yes, even when adjusting the ISO to 400). 1. Yes, red-eye is pretty bad, but easy to fix with software (no, I'm not using Sony's software). 2. I don't care that much about the missing tripod slot. 3. I've had no trouble keeping the lid closed. 4. USB and charger are a little bulky, but you can buy a small charger and USB from Sony, and/or buy a big enough MD card to hold images until you can download. The bottom line is this - I would love this camera if I could consistently get good photos (i.e., in focus and not blurred) out of it. If the camera gets fixed to solve these problems, I'll let you know; otherwise, I can not recommend it. This is our 3rd sony camera and I love them all, but this one.. wow the pictures are so clear, the screen size is huge, and the compact size is amazing. I keep it in my purse all the time for those shots when your just at the playground with the kids and you'd have wished you had your camera, WELL I DO... all the time and use it almost everyday. So easy to use, and such an amazing camera. I would never buy anything but sony, ever. 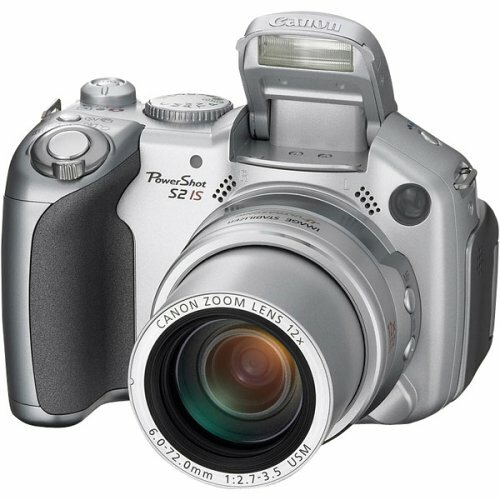 You'll LOVE this camera, it truely is the best! I Love My Camera every where i took it so far i had possitive comments about it, it never gave me a problem like other customer had mentioned in this feedback, if you follow the direction as stated in the manuel you will not go wrong, it is a nice camera awsome screen could not complian nice and big. 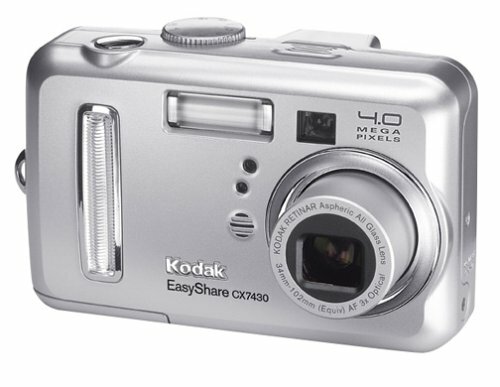 Kodak's EasyShare CX7430 offers high-resolution image capture with fully automatic point-and-shoot simplicity. You'll be able to print vibrant 20 x 30-inch enlargements thanks to the CX7430's resolution. The CX7430 also integrates Kodak's new camera Favorites feature for storing multiple pictures in an on-camera digital photo album. Other features include a 3x optical zoom, Kodak's new Color Science image processing, TV-quality (VGA) video capture and playback capability, an on-camera speaker, 16 MB internal memory, and compatibility with SD and MCC memory cards. Scene modes--represented above by pictograms--automatically control camera settings to give you what's right for your particular shot. This camera has a maximum resolution of 4 megapixels (2304 x 1728 pixels), and it offers a 3.5 MP mode (optimized ratio for 4 x 6-inch prints), 2.1 MP, and 1.1 MP (good for emailing. The CX7430 has a Kokak Retinar aspheric all-glass lens with a 3x optical zoom (34-102mm, 35mm equivalent). It features through-the-lens (TTL) autofocus with multi-zone and center-spot selectable modes. The CX7430 can capture both full-motion video with audio (20 frames per second at 320 x 240 pixels) and TV-resolution video (VGA; 640 x 480 pixels at 13 fps) with capacity dependent on available memory (16 MB internal memory included; additional memory may be added via the SD/MMC expansion slot). The included A/V cable enables you to show your masterpiece on TV quickly and easily. Images can be stored within the CX7430's 16 MB internal memory, or on optional Secure Digital (SD) or MultiMedia (MMC) memory cards. It connects to Macs and Windows-based PCs via USB 1.1 connectivity. Clear, easy-to-use menus explain the camera's many features. With a touch of the red-jeweled Share button, you can store up to 100 pictures in an on-camera digital album. These pictures can then be shared anytime on the camera's large, 1.6-inch indoor/outdoor LCD screen. The Share button also allows selection of photos for printing and even e-mailing, with up to 32 e-mail addresses stored in the camera's memory. Kodak's Color Science Image Processing Chip offers a new high-speed digital image processor, advanced algorithms, and hardware acceleration features that enable the CX7430 make simultaneous, split-second decisions to produce rich, vibrant, true-to-life colors in almost any lighting situation. Each time you click the shutter, the Kodak Color Science Chip performs an instantaneous and advanced analysis of collected scene data to identify and correct multiple factors that influence picture quality. Scene light source is detected and adjustments are made to capture bright whites and true, vivid colors under difficult lighting conditions--fluorescent, tungsten or daylight. Scene content is analyzed for luminance, focal distance, subject matter orientation and color to determine the correct exposure and capture the natural details, accurate flesh tones, and rich colors you see in your composition. The camera is powered by 2 AA batteries (alkaline included; NiMH rechargeables recommended). It measures 4.0 x 2.6 1.5 inches (W x H x D) and weighs 5.2 ounces without batteries. This package contains the Kodak CX7430 digital camera, 2 AA batteries, USB and A/V cables, wrist strap, and custom camera insert for optional Kodak EasyShare 6000 series camera and printer docks. The, "customer from Glendale" needs basic camera lessons. You cannot give a camera a bad rating, because the flash fails to illuminate a subject over 10-20 feet away. Camera flashes aren't powerful enough to do that. Get a clue. As for this camera itself, I have tried it out at Best Buy, as we are getting ready to buy a new camera, and it is down to this one, and the Kodak LS743 4MP. Basically they are both the same camera, but the LS743 has a slicker design, and is more compact. But other than that, they are both great cameras. If you are going to review technology, *please* have some idea about it before you write anything. Otherwise, you will just end up making yourself look foolish. I love my kodak easy share camera. It is a good camera for the price. However, just a warning, if you have a problem with your camera, kodak has very poor customer service and is unwilling to help you fix your problem. You will have to take care of it on your own at a local dealership. Pros - Light weight, small, handy, good pic quality and lot of flexibility while shooting. User friendly software. Cons - Rechargable battery and charger should come with the package. Best "bang for the buck" Camera! I am absolutely delighted with the Kodak CX7430 and wholeheartedly recommend it. 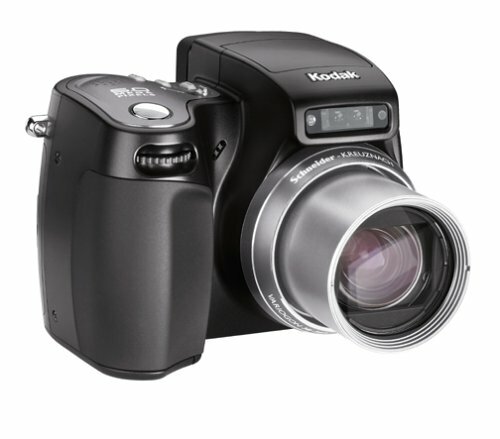 Kodak has cornered the market in offering tremendous features for extremely reasonable prices. I upgraded to the CX7430 from the CX7000 because I was so happy with the Kodak line. 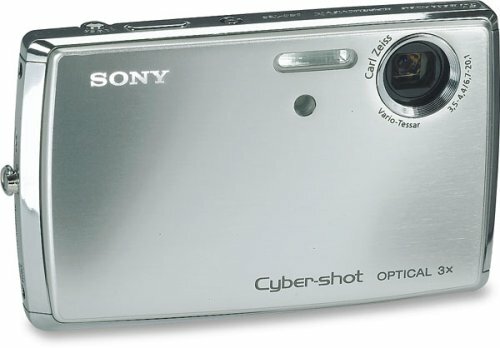 The CX7430 offers great features, such as both optical and digital zoom, and video capacity with sound, along with an outstanding 4 MPs. The operating system is the simplest and easiest to learn and use of any brand of digital camera. 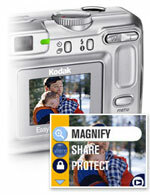 The entire Kodak Easy Share system makes downloading, editing, printing, and e-mailing pictures a breeze. This is THE 4 MP camera to buy!